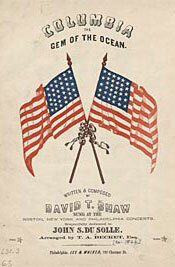 "Columbia, the Gem of the Ocean" received an American copyright in 1843 and is credited to the name of David T. Shaw. Yet to understand the true origins of Shaw's song one must follow two threads. One thread leads to Thomas a'Beckett who claimed to have rewritten Shaw's lyrics before the song was copyrighted. The other thread leads to Stephen Joseph Meany who wrote the poem "Britannia, the Pride of the Ocean," from which, in turn, a'Beckett may have taken his lyrics. "Columbia" was a common poetic nickname for the United States of America during the nineteenth century. In illustrations and cartoons, the United States was often represented by a heroic female figure named Columbia, dressed in a flag-like bunting. Other nations used similar figures, notably the French Marianne, and the British Britannia. When born by the red, white and blue.